There was a time when I didn't know Steve Martino's name, but his signature aesthetic—vibrantly colored walls, sculptural desert plants, dramatic interplay of light and shadow—is something I've been familiar for as long as I can remember. Previously, the only way you could see Steve Martino's work was in magazine articles. His website has great photos, but there are never enough for my taste. 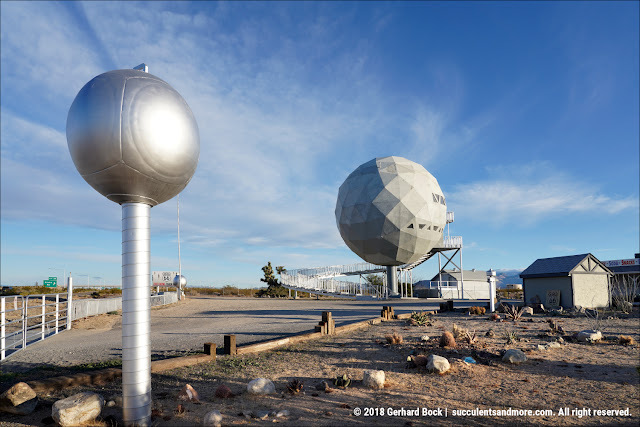 And with the majority of his projects being private residences, primarily in the Southwest, it's virtually impossible to visit them in person. That's why I was so excited when a couple of years ago Steve Martino mentioned on his Facebook page that a book was in the works. That book is now here: Desert Gardens of Steve Martino, written by Caren Yglesias and photographed by Steve Gunther, published in April 2018 by Monacelli Press. I am a landscape architect by title but I consider myself a garden designer. I’ve never had much interest in putting plants around buildings. 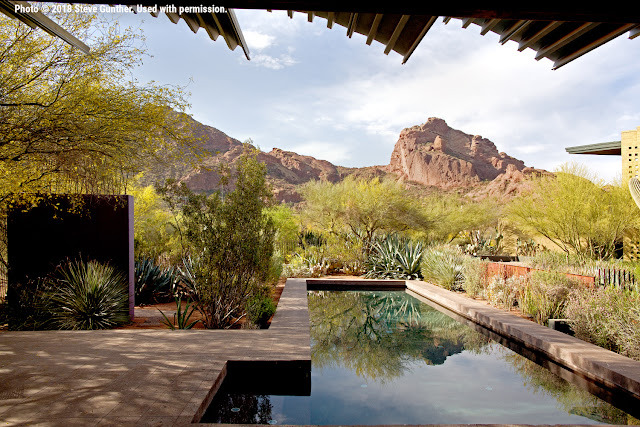 I am more interested in creating outdoor living spaces that make a connection between architecture and nature. I think of garden design as an art form; it’s my art. I like to solve problems and to create interesting places that my clients love to be in and that are grounded to the natural processes of the site and region. To me a garden is a man-made outdoor space that is created for personal enjoyment. I’m not interested in flower gardens or vegetable gardens. They are ok, but I’m not interested in them. I am more interested in gardens as architecture. In the west landscapes are like terminally ill patients. They are tethered to IVs and monitors and need constant attention to keep them alive. If someone pulls the plug, the garden will die. The only way I know of to break out this situation is to use native plants. They have less of a demand for water and fertilizer, which is much better spent on food crops. In the west, water guzzling lawns are the biggest culprit, along with air pollution caused by their continuous maintenance requirements. My intern, Lora, was explaining the 3 tenants of sustainability to me: environmental, social and economic. I told her my definition of sustainability has always been very simple: when the power or water is shut off your garden should not die. I highly recommend you read the entire text of Martino's lecture. It provides valuable insight into who Steve Martino is as a professional, and how he approaches his work. 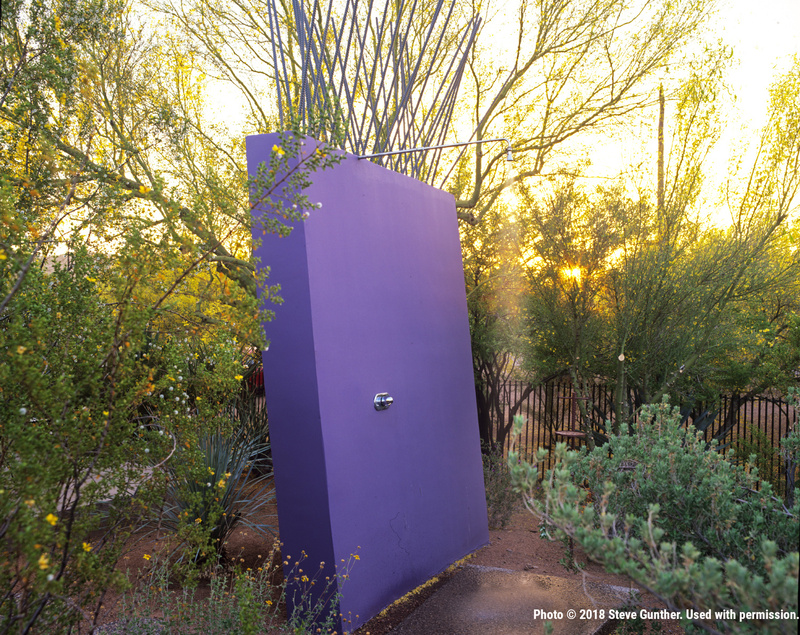 This, in turn, will give you a fuller understanding of the 21 projects showcased in The Desert Gardens of Steve Martino. The book itself does a great job introducing readers to the world of Steve Martino. The preface by Caren Yglesias, the book's main author, and the foreword by architect Obie G. Bowman touch on the essential components of Martino's work: his focus on native plants, "obsessive search to provide visual and acoustic privacy," efforts to "design and live in recognition of place [and] in harmony with an active and healthy ecology." 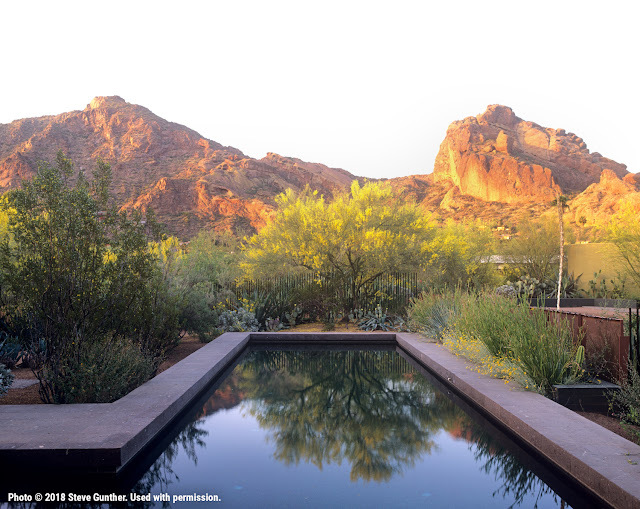 In his essay titled "Weeds and Walls: Epiphanies and Lessons Learned," Steve Martino talks about his own life, experiencing the desert up close while living on a ranch during his teen years, and studying landscape architecture at Arizona State University. In 1970, he dropped out of architecture school in his third year because of an accident and went to work doing site design for a Phoenix architecture firm. 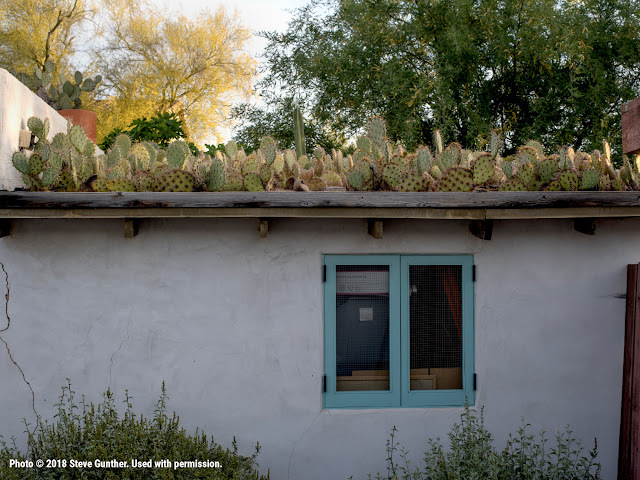 He began to question the focus on plants that need a constant supply of water and fertilizer when plants native to the Sonoran Desert need virtually nothing. 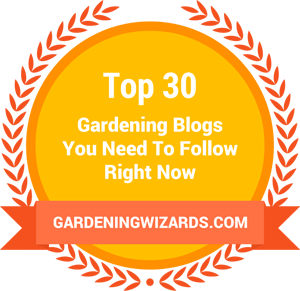 However, since they were generally considered "weeds," they were hard to find in nurseries. One pivotal moment came when Martino met Ron Gass who had a small native plant nursery. This was a unique opportunity for Martino to learn from a "walking encyclopedia of knowledge." The two of them went on seed collecting expeditions, and for a while Martino even worked at Gass's nursery as a laborer. After Martino had started his own landscape architecture business, Gass would grow plants from seeds Martino brought him, and Martino would trial the plants in various projects. And as Martino began to achieve professional success, so did Ron Gass: his business, Mountain States Wholesale Nursery, would become the leading supplier of desert plants in the country. Quite a few plants in my own garden are from Mountain States, including the Hesperaloe 'Sandia Dawn' I brought back from Austin, TX recently. In the book, Steve Martino calls himself an "accidental landscape architect:"
It never occurred to me to become a landscape architect; I just wanted to use desert plants in my projects, which became the idea to bring the desert into the city. This idea was met with resistance at every step of the way probably because so much effort was being spent on removing the desert. It was pretty much despised by everyone. It was basically gravel, sometimes painted green, with a few cacti or rusty wagon wheels proudly placed around the property. I called these "gardens of despair." I wanted my projects to say something about where we live by celebrating the desert rather than make apologies for it. All my projects needed to be demonstration projects for my future clients, the profession, and the public. The first half of my career was a struggle to get clients to use desert plants, which were viewed as weeds. Once I started to receive ASLA design awards it seems to legitimize my work and give me national exposure. Clients [...] come to me with high expectations of what I can do for them. The discussion of sustainability and appropriateness of native plants doesn't even need to come up. This is 180 degrees from where I started. For each garden, Caren Yglesias gives an insightful overview outlining the site, its specific challenges and requirements, and the homeowner's brief to Martino. A site plan shows the arrangement of the house and the landscaping elements. 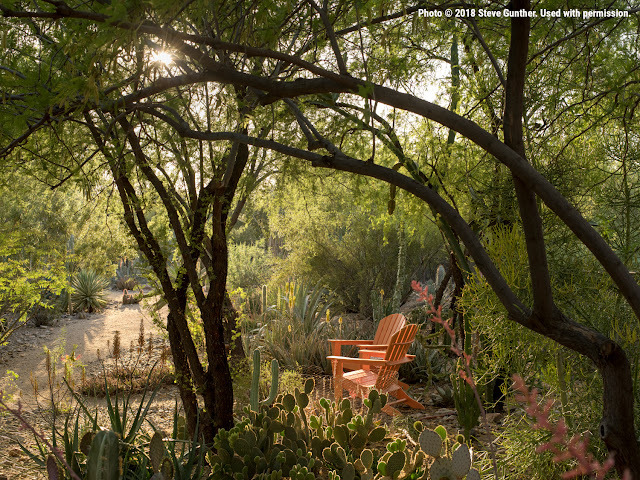 Steve Gunther's stunning photographs—the result of countless hours of waiting for the best light—bring the gardens to life. Even if you knew nothing about Steve Martino's design philosophy, you would thoroughly enjoy the book purely on a visual level. 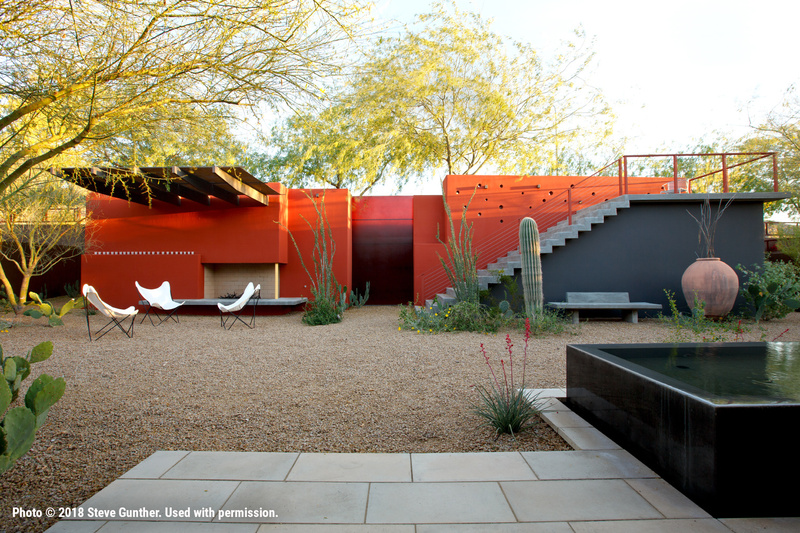 The 21 garden portraits illustrate all the essential elements of a Steve Martino design, above all privacy. "I'm a fanatic about creating privacy," Martino says. "Not only do I not want to see the neighbors, I don't want to see their houses and I don't want them seeing me." This often requires unconventional approaches, including freestanding walls, or walls camouflaged as sheds to meet city regulations. 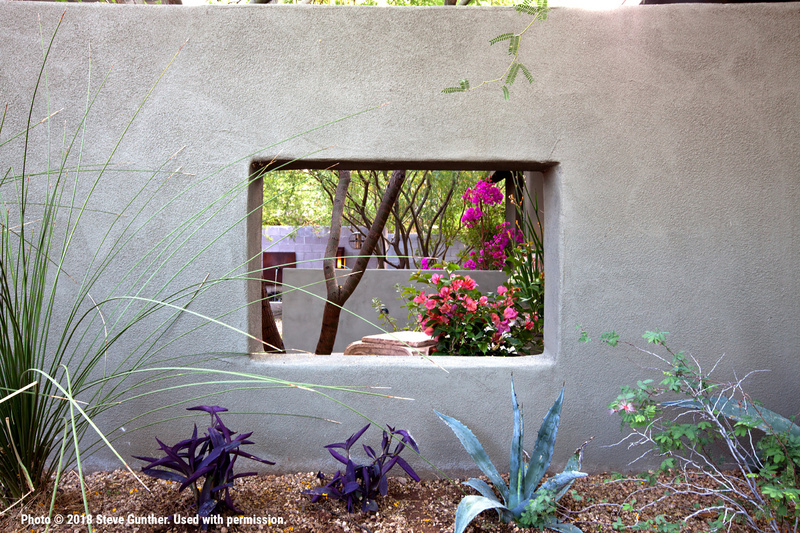 Virtually every project in the book includes at least one colored stucco wall. 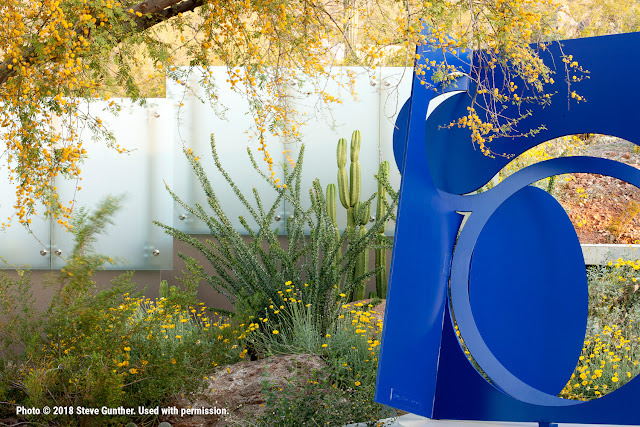 Martino pioneered what would become his signature element in a 1983 project for Arid Zone Trees, a wholesale tree grower in Mesa, AZ. The inspiration came from the work of Mexican architect Luis Barragán (1902-1988), a major influence on generations of architects around the world. Martino's other trademark elements include the use of steel and translucent panels, cantilevered shade structures and stairs, outdoor fireplaces, as well as simple but refined water features. "Like all designers," Martino says, "I want to make outdoor spaces that people want to be in; I try to do it in a simple straightforward fashion. I want the garden to say something about the site and the region." The photos in this book are vivid proof that Martino succeeds on every level. 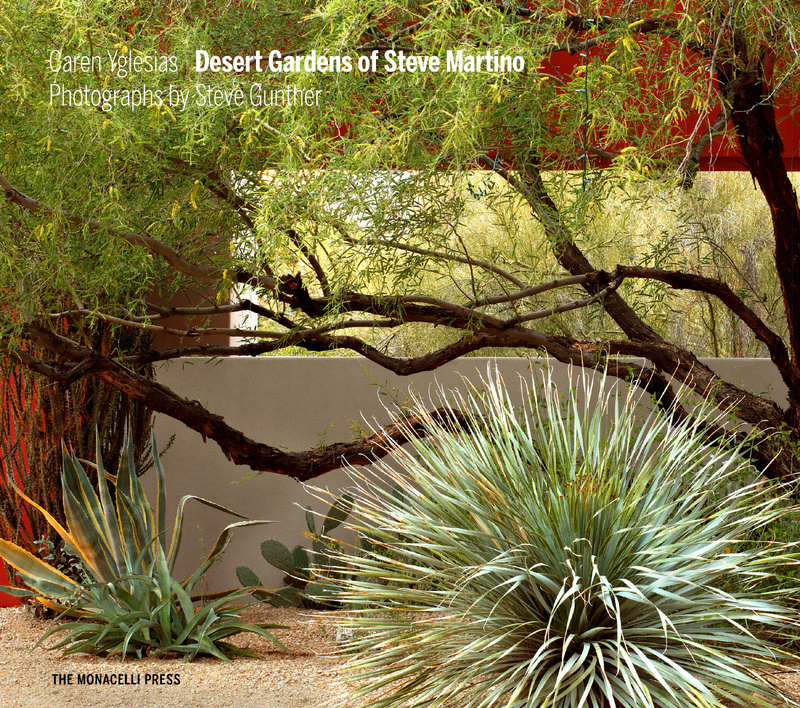 Desert Gardens of Steve Martino (The Monacelli Press, 2018) is available now, either directly from the publisher, your local bookstore, or the usual online sources. I would rate it a must-have book for anybody captivated by desert landscaping, and it will also appeal to people interested in contemporary garden design in general. I, for one, know that it will be one of the most-thumbed books in my bookcase. I'm glad it's printed on coated paper that should be fairly resistant to the drool I'll continue to produce as I look at Steve Gunther's aspirational photos. My job now is to figure out a way to introduce Steve Martino style elements into my own garden. Steve Martino's blog, Weeds and Walls, hasn't been updated in a long while, but it contains a wealth of insight into his thought process. You'll also see his own photos from projects and travels. I find it fascinating to see what catches Martino's eye. Thanks for the recommendation! This looks like a facinating book... I will have to find it. Excellent review, Gerhard. I am anxiously awaiting my own review copy. I have been so inspired by Steve's work since before I met him on a trip to Phoenix and got a personal tour of two of his clients' gardens, which I've featured in my own books. His style has definitely influenced my own garden in Austin, where I built three painted stucco walls. I can't wait to read the book. I've followed both Steve Martino and Ron Gaza's careers over the decades, and admire them both greatly. They certainly have made a lasting change in attitude towards Cedric gardening style, even influencing my own designs in the much milder Bay Area. Great write-up too Gerhard, thanks! Definitely a must-have -- thanks for such a comprehensive review! Do you freelance write book reviews? You did an amazing job highlighting his work making me want to find a copy of it. What an excellent review, Gerhard; you've sent the book to the top of my wishlist. 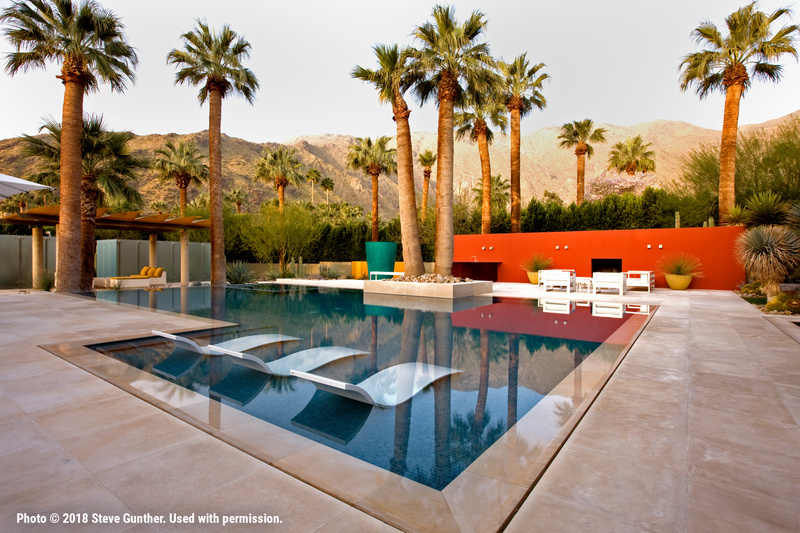 The photographs alone would make it worthwhile, but the inclusion of the owners' brief, landscape situation, plans, and Martino's design thinking makes this irresistible. Although the style and plantings of are the polar opposite of the humid, Appalachian terrain and formal, Federal-era architecture here, there's something to learn from the way any skilled designer solves problems. My first exposure to Martino's work was in the book Outside In, by Paige Dickey (also highly recommendable to anyone in search of design inspiration). Can't wait to read Desert Landscapes! Another great garden book to put on my list! The 5th photo alone sells it. 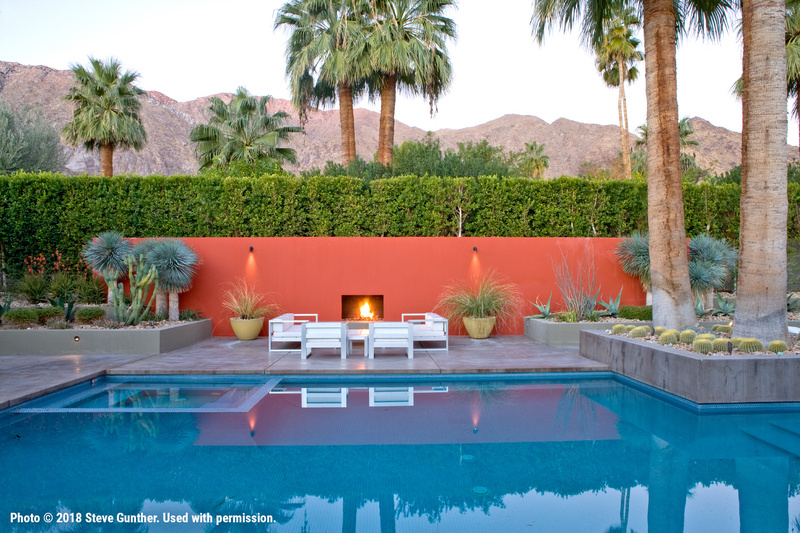 A landscape architect who puts garden design first is a treasure. "In the west landscapes are like terminally ill patients. They are tethered to IVs and monitors and need constant attention to keep them alive. If someone pulls the plug, the garden will die." Really enjoyed your review and quickly rushed I’ve to read his Oxford. Love the piece about concrete. I have to get this book because strangely we have a son who lives in Phoenix, went to architecture school at ASU and then chose a different career path. And I often think how wonderful it would be to make a desert garden having visited there many times. If only we didn’t get so much rain ( often at the wrong time!) here. Thanks for the excellent overview, including all the topics you got Martino quotes on. And I hope readers follow your suggestion to read his Oxford Lecture. I just finished the "Desert Gardens of..." book today. He and I correspond every 4-5 years by phone or email on something, it seems, and he's one of the few reasons I stuck with my former career as long as I did. The ideas that Steve has are priceless, always laced with humor. Now, I want to include "sheds" in my now-side design work! "I'm a fanatic about creating privacy," Martino says. "Not only do I not want to see the neighbors, I don't want to see their houses and I don't want them seeing me." Nice to know I'm not the only one who is fanatic about this! Great post--thanks!